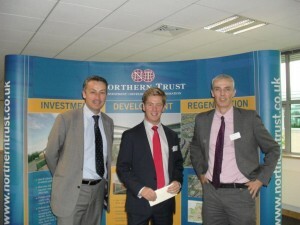 Northern Trust formerly unveiled their refurbished 22,900 sq ft office scheme; Vortex House, Wavertree at a breakfast reception. The event held on 26th September was attended by a number of Liverpool and local agents. Vortex House occupies a prime position at Vortex Court which comprises three contemporary office buildings in an attractive landscaped environment. Sitting at the head of the scheme Vortex House offers exceptional modern accommodation totalling 22,900 sq ft with ample car parking. The building has been refurbished to a high standard and includes, full access raised floors, prestigious entrance foyer, 8 person passenger lift, suspended ceilings with fluorescent lighting and double glazed tinted anodised windows. For the full press release please click here. Further details about Vortex House can be found on the dedicated website www.vortexcourt.com or you can contact one of the joint lettings agents on the scheme: CBRE on 0151 224 7666 or Whittle Jones on 01257 238666.